Whitby is on the North Yorkshire coast at the mouth of the River Esk. The weather was grey and a very summery 9 degrees celcius, but clear enough for cricket when Julie visited. 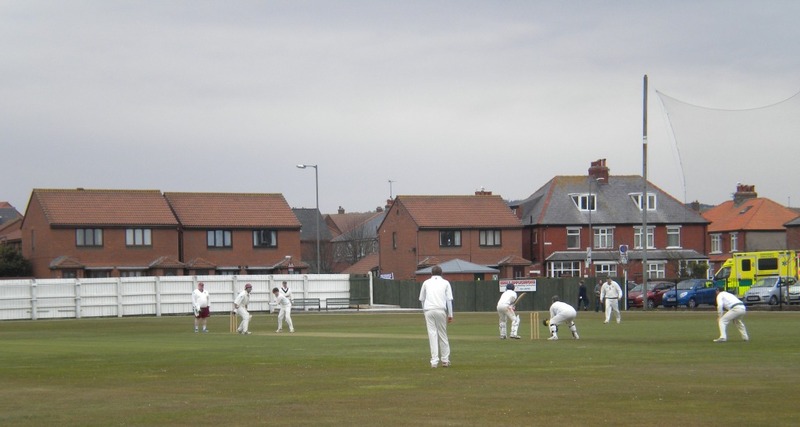 The ground at Whitby, home to the cricket club since 1928, is bounded by housing on three sides and the local football stadium on the fourth. Just a street away are the North Sea cliffs. 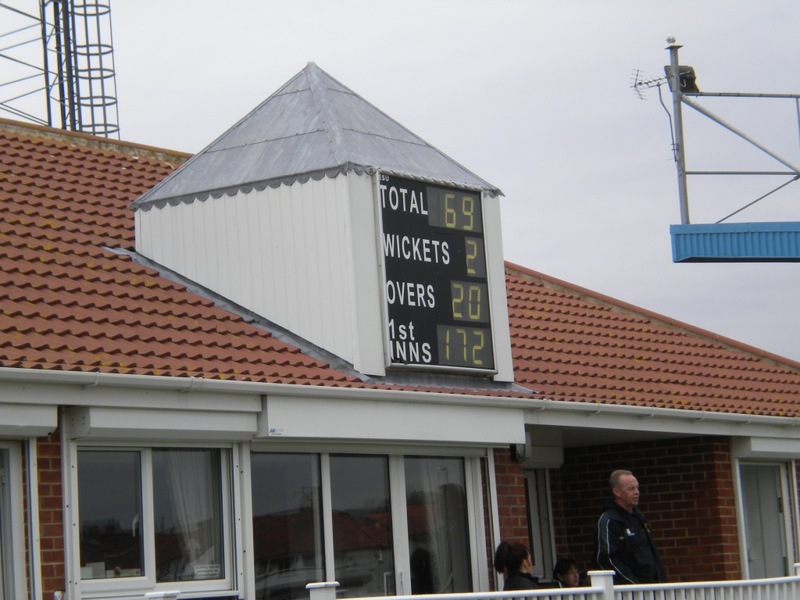 The scoreboard atop the pavilion gives the players essential information, while a newer, larger scoreboard attached to the equipment shed has more details. 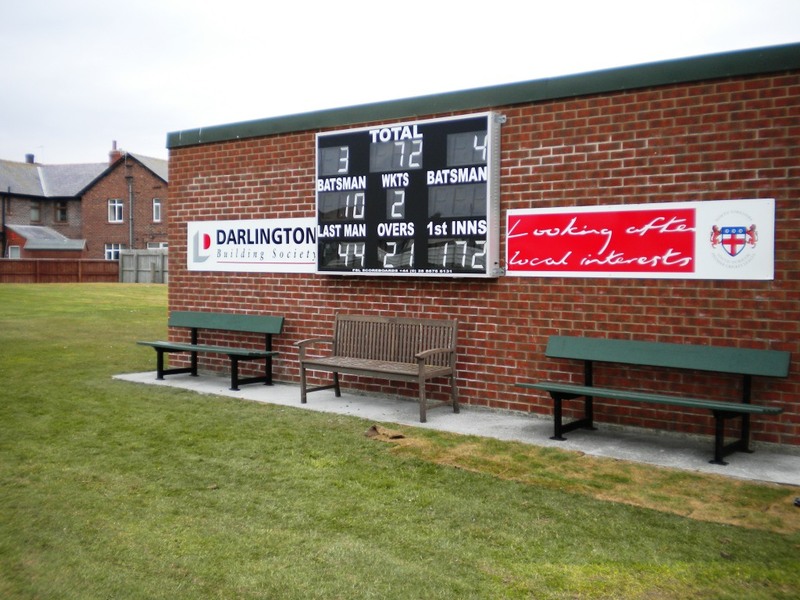 Whitby’s first and second X1 teams play in the North Yorkshire & South Durham ECB Premier Cricket League. The thirds are in Division A of the Derwent Valley League, and Wednesday night team play in the 2nd Division of the Esk Valley Evening League. Julie wasn’t able to stay for the end of the practice match but noted that the visitors needed 19 runs from the last two overs with one wicket in hand. Maybe a friendly committee member from Whitby CC will let us know how the game finished. Many thanks to Julie Pollard, who travelled to England courtesy of Scoreboard Pressure International Airlines. Julie arrived back in Australia in time to see her beloved Sydney Swans defeat St Kilda in Round 5 of the Australian Football League.